As a regular patron of Bootless Stageworks’ productions, I look forward to seeing the schedule every year. Familiar pop culture stories appear in some shape or another, year after year: Evil Dead (four times now? ), Terminator the Second, Musical of the Living Dead, Texas Chainsaw Musical, Jerry Springer, the Opera. 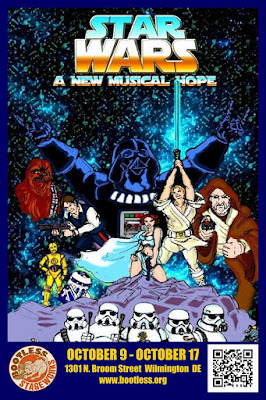 I had seen a Bootless production of Star Wars, a New Musical Hope in 2012 and when they announced its return, I was certain I’d see it again. Although I’d never honor myself with the label of 'sci-fi geek,' the Star Wars movies have, for years, created a common ground for family-time entertainment choices with my now 14-year-old son. While he was all weapons and action figures and play fighting, I was all art and theater and film, and Star Wars was a terrific compromise. Nevertheless, he became my “theater buddy” from a young age, seeing countless Shakespeare productions, literary classics and Broadway hits starting around age 4. Whimsical productions, such as what Bootless offers, ensured there was some payoff for him during those awkward years when I had to push a little harder to get my theater buddy on board with my entertainment plans. This production was a musical parody of Star Wars, Episode IV: A New Hope, scripted by local playwright, Jeremy Gable, and with music by Timothy Edward Smith and Hunter Nolen. The cast consisted of Caleb Duffy (Luke), Shaun Yates (Obi-Wan Kenobi), James Fuerst (Darth Vader), Ryan PJ Mulholland (Han), Maria Leonetti (Leia), Christopher Waters (C3P0), and Bob Ferst (a 7-foot-tall Chewbacca) as well as Wes Belli, AJ DellAversano, Bob Demarco, Mark Dixon, Mariza Esperanza, Robin Fanelli, Shamus Halloran, Shawn Kline, Andrew Laino, Tom McCarthy, Sean McGuire, Samantha Moscony, James Scotland, Luka Villani and Sedric Willis. Rosanne Dellaversano directed. What I’ve come to expect from Bootless when they stage a parody is home-spun special effects created with a sustainable, 80-seat theater budget. There is a certain level of amusement that comes from seeing how Bootless delivers on something a Hollywood director had tens of millions to spend on. (Oh, the amount of cardboard used in Terminator the Second! Such a contrast to the Shakespearean dialogue.) I’d like to think I can suspend disbelief more easily for a sustainable budget than I can for a behemoth, and I know I’m not the only one who loved Bootless’ solution to the car chase challenge in Terminator the Second. For Star Wars, the MOE 365 FIRST Robotics Team created a robotic R2D2. It was thrilling to see it roll out of stage right unassisted on opening night, and none too surprising to hear the mechanical parts struggling as it failed to roll back out again at the end of the scene. To be clear: PLEASE TRY THIS AGAIN NEXT TIME, BOOTLESS! I love your risk-taking and whimsy and I’d rather see Anthony crouching down to save R2 from falling over during the scene than see you not take the risk. Bootless made effective use of several video projections, and a simple structure representing the cockpit of the Millennium Falcon did the trick for travel scenes. Otherwise, the staging was fairly sparse; given the number of people who needed to be on stage together during some scenes, this was understandable. The trash compactor scene was well-executed with the old Kuroko-holding-a-moving-wall trick. When you know a story as well as I know Star Wars, it can be challenging to stay “in the moment” and one’s mind focuses on funny little details. I could not figure out why the heck Obi-Wan’s sleeves were tucked into his robe, until he “disappeared” through the left curtain, leaving his robe in the familiar puddle that marked his mortal exit in the film. I’m laughing now as I write about it…very cute. Other costuming and staging details that entertained: the brown creature consuming a dead Greedo in the Cantina, the purposely repeated scenes with the same two actors behind the bar/control panel, the tiny skeletons after the Tattooine slaughter, Luke’s blindfolded piñata-esque training scene. The Chewbacca costume was excellent, and Ferst managed his stilts masterfully. I was certain C3PO was going to inadvertently drop trou, a couple of the Stormtroopers had camel-toe, and I really wanted Leia to have boots instead of ballet flats, but we’re talking about sustainable theater, not obsessive cosplay. I recall past productions where Bootless incorporated live music and I look forward to more of that; if a theater has to use canned music, making sure it works well is key, and I don’t recall any technological distractions, volume was just right, speaker quality was good, etc. Lighting was equally digestible. Bootless had artist Blair Webb drawing live on site, having designed the promotional art of the production. The costumed cast came out after the show for photo opportunities. These were extra special touches for sci-fi fans and theater lovers alike. The stage speech was intentionally drawn out: a large party was stuck in traffic and their post-start arrival would have been disruptive to the rest of the audience. The run for this show has ended, but be sure to check out Bootless’ production of The Light in the Piazza – a “nearly operatic” musical, including some Italian language singing –starting November 6.